"Know ye not that ye are the temple of God, and [that] the Spirit of God dwelleth in you? If any man defile the temple of God, him shall God destroy; for the temple of God is holy, which [temple] ye are. And ye are Christ's; and Christ [is] God's." 1 Corinthians 3 16-17, 23. There are many discussions about revival of spirituality in Russia nowadays. Great attention devoted to reconstruction of sanctuaries, which were profaned during the soviet period. Finally, we have recollected the belief in God of our ancestors, we are trying to restore links of the times by giving life to temples and monasteries that had been built for centuries and turned into ruins over a few decades. Reconstruction of temples in urban areas is going with a quite a good pace. Temples there are growing right before our eyes. Unfortunately religious life in our country is concentrated mainly in the urban area beyond which we can see an absolutely different picture. As a rule, reconstruction of temples in a village is much more complicated than in a city. 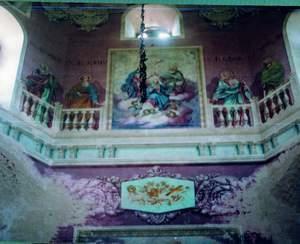 Country people are unable on their own to restore a Divine House, which took years and years to be built. Temples urging reconstruction keep getting decrepit and often face the danger of a complete destruction. It is much more difficult to find people for the most needed help for restoration of a rural temple than for one in an urban area. Father Vladimir Shuvalov, senior priest of five-altar temple of the Epiphany of the Lord in Buylovo, Tverskaya Oblast (80 km from the city of Tver) has served there already for more than 12 years in the non-heated premises. Only after 9 years of religious service in this temple he has managed to start the reconstruction works. The father does not like to tell about the hardship he went through over this time (he would always reject with an inherent modesty such words as "sorrows" or "ordeals" with reference to himself and his family). However it is known that during the first four years father Vladimir had to go for services to Buylovo temple from the village where he lived with his family 12 km by feet or cycling and same distance from the temple to come back home. No matter the weather. The father had no car and nor funds for it. On the other hand he had a growing family as one orthodox believer should have. Now the father has eight children, six of them sing in the church choir together with their mother. Their Family Chorus "Lampada" (means an icon-lamp) is well known in outside Tver. 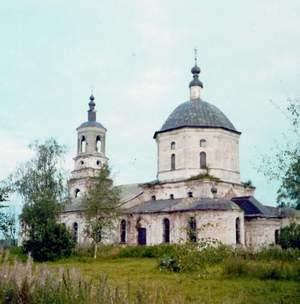 Before 1728 people of Buylovo together with the neighboring villages have been a part of Georgievskoye Village parish. 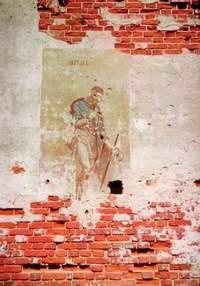 Landowner, a Polish by birth, had oppressed people attending the temple in Georgievskoye. Therefore in 1721 the believers gathered at the community meeting and made a decision to build a wooden temple on uncultivated ground. The temple has been erected by joint efforts of the local people within 10 years. As the time went by the wooden building had become decrepit, and in 1792 at the general parish meeting it was decided to build a stone temple in Buylovo village. The main part of the temple was completed in 1810 - generally on the donation of a wealthy farmer Grigory Fedorov of Ustyugi village. In 1815 two altars in refectory (south altar devoted to St. Nicolay (Claus), north altar devoted to the Great Martyr George Victorious) were consecrated. After another 50 years (in 1865) a consecration of the main altar in honor of Epiphany of the Lord took place. Construction of the temple lasted until 1895, i.e. over one hundred years in total (from 1792 trough 1895). Side-altars one after another have been attached to the temple building and once completed they were adorned with skilled paintings and gilded iconostasises. In the soviet times the temple in Buylovo was closed, than the building was given to kolkhoz and local cooperative society for using as a warehouse. Unfortunately there is nothing remaining from the iconostasises, the extant fragments of paintings are getting dim because of the water leaking through the old roof. In old good times the parish community reached the number of 5 thousand people. When the public worship recommenced in 1992 the population comprising the Epiphany parish including neighbor villages was 763 people most of whom have retired. Among these people there are those who are willing to attend the services, who are seeking for God (each human sole is valuable in the eyes of God). However, unlike their ancestors today's local people have no possibility to arrange the reconstruction works urgently needed to prevent destruction of the temple. Nowadays several Tver companies support father Vladimir in the reconstruction of the temple. However this help is not sufficient. The number of difficulties the father has got has not decreased. Often he has to settle a lot of issues in rush order. Sometimes plans of donators change, sometimes problems arise with urgent search of volunteers to help with unloading of granted materials or to help with cleaning and scavenging. The temple is in urgent need of restoration. During those years when recovery works have not been conducted vaults of several side-altars began cracking, plaster and breaks started falling. These side-altars will be completely destroyed unless appropriate measures are taken within next two years. First of all it is necessary to recover the roof. All of these measures need funds and resources that local people do not have. Urgent help is needed. Father Vladimir keeps saying that main thing is the temple of heart. And state of this inner temple depends on ourselves. Our life and salvation of our soul in Christ's name as well as salvation of Russia depend on our treatment of sanctuaries that were built for us by our ancestors. Russia is regenerating spiritually despite any obstacles. However, this regeneration should not be focused only on cities and towns leaving villages to die nor should it be given to non-Christian people originating from Asia who probably will settle in our villages and build their own temples, which could result in biased in such events negative feelings in ourselves. There are some examples when reconstruction of a temple and recommencement of a parish caused revival of a villages itself. People from cities and towns started to come to country parish at first only on weekends but eventually some of them would buy houses in such village. We would like to address this message to all of those who are not indifferent to the fate temples in the rural areas and who has a will and ability to take part in restoration of the Epiphany Temple in Buylovo. The parish needs building materials, funds as well as your personal assistance for the reconstruction. Father Vladimir also needs volunteers to help with unloading breaks or board limber and for cleaning and ennoblement of the temple territory. There will be a plenty of work in the temple for quite a long time. While there is a possibility to do a piety do not miss or disregard it. God will find people for work He blessed. First of all it is important for you, for the temple of your heart.